The 25th edition of Avavit trade show, took place on May 31st and June 1st at Eurobuilding Hotel in Caracas. The B2B leisure show gathered personalities of the tourism industry. 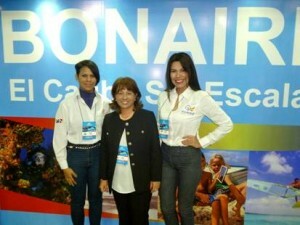 The Minister of Tourism in Venezuela officially opened the event and visited the Bonaire booth. The tourism fair was the platform for Bonaire to announce the strategic alliance with Sundance Air/Bon Sky and Wholesaler Candes Turismo Internacional, to improve airlift to Bonaire from the market of Venezuela. The news of direct flights to Bonaire created much interest among travel agents attending the show. Reliable connectivity continues being an influential factor to grow tourism to Bonaire from South America. Sundance Air is focused on targeting upscale corporate tourists that value the exclusivity of a direct flight to the island. 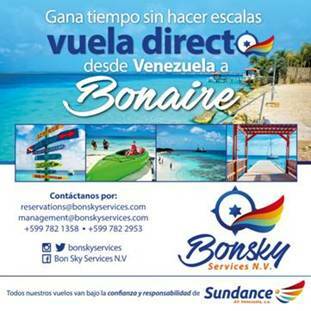 Sundance Air registered Bon Sky in Bonaire and actually offers charter services during holidays in Venezuela. After her recent visit to Bonaire last April, Mrs. Consuelo Lugar Owner-Director of Candes Turismo, is enthusiastic to promote Bonaire counting with reliable airlift and competitive packages from the hotels. Candes is a well known organization working for more than 35 years in the Venezuelan Tourism Industry. The Bonaire 12 meters booth at Avavit show was eye catching with images showing the leisure and relax atmosphere Bonaire offers to its visitors. On Tuesday, a Dutch Embassy delegation attended an official invitation to visit the Bonaire booth at the show. Mr. Hein Knegt, Head of Mission and Mrs. Mariana Núñez, Commercial and Cultural Advisor, were pleased with the news of the nonstop flights to Bonaire. He will give support to this important airlift project for the Island of Bonaire. Ending Avavit, the promotion of Bonaire will continue. An ambitious Bonaire training program directed to travel agencies will start in Caracas, extending promotional efforts to key travel agencies located in the main cities of Venezuela. Reactivating tourism from Venezuela is one of the challenges TCB Latin America has focus on for 2016.